Mental health in dirt, this is my philosophy. Worms know more than we do. They’ve passed millennia wriggling in pleasure, enjoying what most Americans have no idea even exists. I’d advocate tearing up three fourths of the concrete in the U.S., but first—go out in your own backyard, get religion, get the scents in your nostrils and the crust on your knuckles, wear holes in your knees in your gloves in your ignorance of what is great. Get down. I passed the entire day in the garden. I hadn’t worked in the yard since November, no wonder I had a mental max offload. Twenty minutes in the garden releases two days’ stress doing anything else. Forget the word garden, any dirt will do. Sit down in a chunk of dirt and let your breathing mimic the bending of weeds and flit about of birds. Did you know a tanager is large and yellow with an orange head? Do you know what a tanager is? It eats worms from dirt, that’s a hint. My friend Patrick invited me for tea, yesterday. He’s built a little room on the back of his house to house a couch and a basket of bird books and binoculars. He's taped small paper stars on the windows, so the unlearned observer sees blotchy bits along with the active birds. And then learns how to focus. Do you know why the tiny blue-headed lazuli buntings and hummingbirds and quail and copper rose and cherry trees and nandina all live there in his shady, overgrown, water-splashing, flower-scented garden? Hop on board, it’s the best train running. Views, friends, foodstuffs, surprises, and day-long reliable delight. 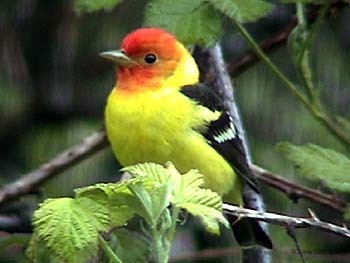 Western tanager photo thanks to Birds Amore. P.S. Patrick paved the area under his bird feeders, with brick. That way you can see the birds vs. lose site of them in the grass. And paving prevents the fallen seeds from making mushy green forests under the feeder. You can simply sweep the seeds away. Go Patrick go. P.S. I’ll bet those stars are to keep birds from flying into the window glass. For me, it's not just watching birds or working in the garden that are therapeutic. The act of turning compost is almost holy; the daily changes in temperature, texture, color, and weight are fascinating to see. Each change raises questions ideal for idle compost-turning speculation: Where do those banana peels go so magically? Why won't avocado skins disappear the same way? Did the apple core really just cook away or did some critter I'd rather not know about chew it up? Each day a new puzzle.